You are going to flip for these Italian sloppy joes. Topped with melted provolone and homemade giardiniera - this is just for starters. An easy ground venison recipe that you can prepare in no time. It's a great twist on an American favorite. You may also use ground beef for this recipe. Heat olive oil and add onion with 1/4 tsp salt. Saute until it starts to soften. Stir in the garlic and cook for one minute. Add the ground venison, stirring into the onions until cooked. Add the remaining ingredients and cook until thickened. Taste and add seasonings if you wish. Butter the buns and place cut side down in a skillet and brown. 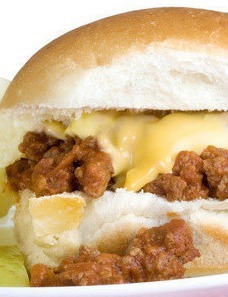 Add sloppy joe mixture and top with a slice of provolone cheese. Garnish with giardiniera. Enjoy this sandwich, it's a keeper. You may crinkle-cut the vegetables if you wish; it looks prettier. Just make sure the pieces are all uniform in size. I like to make them smaller in size, so I dice them. Combine the water and salt in a glass bowl and stir until dissolved. Add the carrots, cauliflower, celery, red bell pepper, serranos and minced garlic to the salt water. Mix, cover and chill overnight in the refrigerator (must do). The next day, rinse the vegetables and discard salt water. 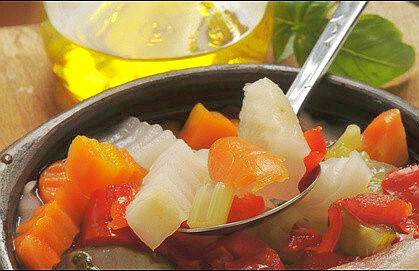 In another glass bowl, mix the oil with the black pepper and oregano. Add the drained vegetables and stir. Allow to marinate again, overnight in the refrigerator. The next day you may pour mixture into air-tight mason jars and will keep in the refrigerator for 3 weeks. This is perfect with Hot Italian Beef Sandwiches.